EBITDA margins have gone up to 19.2% which are higher than the last quarter. EBITDA has reached 62 crores. Gross margin is near about 49% and had improved by 1.75% over the June quarter. QoQ and YoY, an increase of 250 basis points in the margins. A&P expenses has gone up in this quarter due to market conditions from 6-7% to 7%. On the balance sheet Gulf is debt free and is cash positive despite the dividend payments which came in September. Q2 has been the best quarter for Gulf oil. August and September were good months for Gulf. Overall, a double-digit volume growth is achieved in the quarter. 13% growth in volume, supported by the three main segments. Margins have also improved more than 150 basis points. Diesel has also gone into high single digit growth from low growth rate previously. Personal mobility growth was 20%. Q2 sales of oil has been 22500 Kilo-litres. Industry growth of gulf oil has been about 2-2.5%. Delta change is certainly in the three segments, the B2C channel sales. 10% of the volume growth is tracked without base effect of institutional order. Motorcycle and Car segment both have shown a good growth of more than 20% as both come under personal mobility. PCMO sales will take some time as the campaign has just started in Aug-Sep.
PCMO has bounced back to double digit growth after the hit from GST in Q1. The base oil came down from the peak of June-July till October and has been stable around 3%. Bazaar growth has been 2-2.5% overall. Getting an additional capacity of 40000-50000 tonnes without any extra fixed cost of the impact on P&L. Personal mobility contributed 22-23% which was about 18-19% MCO and 4% PCMO. Gone up by about 2% and the balance diesel engine oil is about 36-38%. Automotive industry generally tends to be 18-20%. All these combined factors have led to this Rs.7 to Rs.8 of sales realization. Gulf has continued to invest in its brand and has also launched campaigns for the passenger car motor oils as well. Gulf has launched a Fan Academy for Manchester United, to leverage its global properties. Chennai plant is almost operational where most of the equipment and machineries are in the final stages of installation. The company is prepared to start the production in this plant from Q3. CAPEX apart from the Chennai plant has been around 4-5 crores only and one can expect similar CAPEX in the next quarter as well. B2C business and OEM dealership has provided with growth in the quarter. 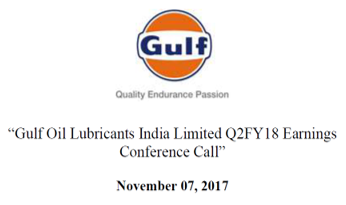 Personal Mobility, OEM related businesses and industrial lubricants had been the three main segments for Gulf which served with huge benefits. Demand is also increasing except the infrastructure segment. Margins have improved because of better realization, pricing distributions and due to the B2C/B2B mix of Gulf, which has been changed from 67/37 to 65/35. As, personal mobility also sits in the B2C. The company is looking to increase sustainability by improving the mix between the B2B and B2C mix, it is also looking to grow margins and volume growth. Personal mobility should grow faster and margins should expand. Price changes take a lag time of about 2-3 months. To take care of the lag effect of the crude oil the company carries inventory which they keep on slightly increasing or decreasing between 10-15 days extra wherever they see an upward trend. The company also negotiates prices for large quantity purchases, as additives are added in and Gulf is able to get the scalability. Maintain an inventory of about 45-60 days for base oil because 70% of this base oil is imported. Share in B2C or bazaar market has been 7.5%. Share in motorcycle segment is 9-10% and in passenger car is less than 5%. South India volumes are close to 30% of overall volumes.Double digit at least Gulf is delivering CAGR volumes for last 7-8 years. 40000 tonnes additional capacity will be able to fill up going forward. Which can be met by shifting volumes, gulf can reach 60% capacity from Chennai and from there it will be ramped up. GST has been a challenge for the company. The most impacted segment due to GST in Q1 has been PCMO. It was a high value product and since the differential was high.